First on the list is play dough. There are a ton of recipes out there – some you cook, some you don’t, some with cream of tartar, some without…you get the idea. Put all the ingredients into a saucepan and give them a good stir to make sure there are no lumps. Place over a medium hob and keep stirring. After a short time, the mixture will thicken and the dough will start to form. Keep stirring until the mixture forms a solid ball that you can roll around the pan. TAKE CARE removing it from the pan – it will be hot. 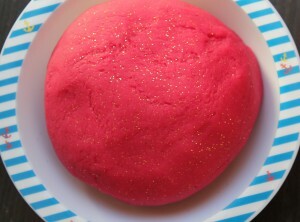 Have fun kneading the warm dough before giving it to the children. It truly is the best bit! This entry was posted in Other on July 29, 2014 by Thomasina Cummings.